Get Ready to Roll with Fun and Exciting Dice Math Games! The kids are going to enjoy these fun dice activities and learn some math too. Object of Game: Players fill in all the spaces on the opponents side of the board with their markers by doing addition and subtraction problems on the dice. Place the game board in the middle of the two players. Each player rolls the pair of dice to determine who goes first. The player with the highest sum plays first. 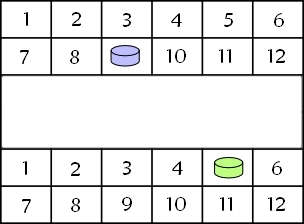 Player 1 rolls both dice and takes note of the two numbers that were rolled. 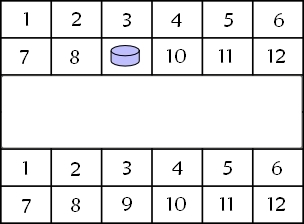 The player can either add or subtract the two numbers rolled. After arriving at the answer, the player puts one of their markers in an empty space on the opponent's side of the board that matches their answer. If the space is already filled their turn ends. Player 1 rolls the dice and the two numbers rolled are a 4 and a 5. Player 1 can either add: 4 + 5 = 9, or subtract: 5 - 4 = 1. The player decides to add the numbers and places a marker in the 9 space on his opponent's side of the board. 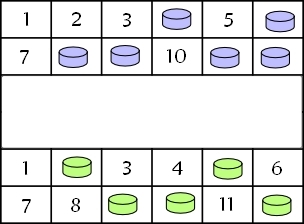 Player 2 takes their turn and repeats the same procedure as above by rolling the dice, adding or subtracting the two numbers, and placing a marker on the opponent's side of the board. Player 2 rolls the dice and the two numbers rolled are a 3 and a 2. Player 1 can either add: 3 + 2 = 5, or subtract: 3 - 2 = 1. The player decides to add the numbers and places a marker in the 5 space on his opponent's side of the board. Players continue taking turns until trying to fill the opponent's side of the board with their markers. The first player to fill their opponents side of the board with their markers wins the game!